Situated in various Canberra locations, Apartments by Nagee offer self-contained accommodation featuring a balcony or patio with outdoor furniture. All apartments include free secure underground parking. Wi-Fi access and 24-hour check-in are available. 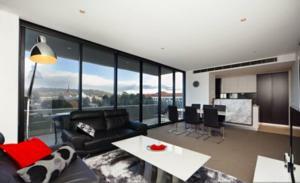 Each apartment includes a spacious living and dining area with a flat-screen TV, a desk and a leather sofa suite. All have a fully equipped gourmet kitchen with stainless steel appliances and granite bench-tops. All apartments offer bedrooms with walk-in wardrobes, bedside tables and an en suite bathroom. Laundry facilities and cleaning products are also provided. Conveniently located in and around the Canberra city centre, Apartments by Nagee Canberra are each within 10 km of Canberra Airport and the Australian War Memorial. Free! All children under 2 years stay free of charge when using existing beds. One child under 2 years is charged AUD 25 per person per night in a baby beds. All older children or adults are charged AUD 45 per person per night when using existing beds. One older child or adult is charged AUD 45 per person per night in an extra bed. The maximum number of extra beds/baby beds in a room is 1. Any type of extra bed or crib is upon request and needs to be confirmed by management. Supplements are not calculated automatically in the total costs and will have to be paid for separately when checking out.